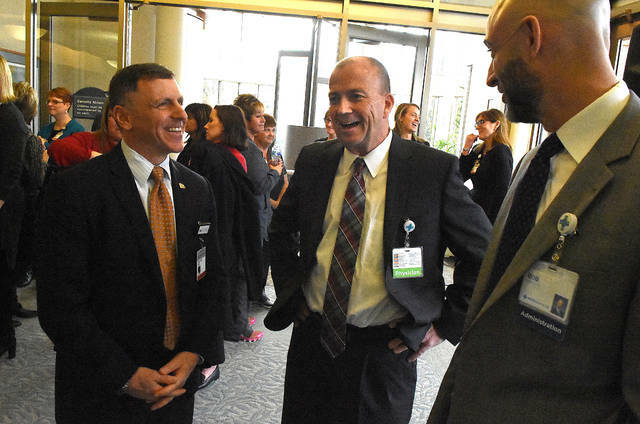 LIMA — The broad smile on the face of the president of Mercy Health of Toledo/Lima told the larger story. Comments from the medical director of Mercy Health-St. Rita’s oncology department made it extremely personal. 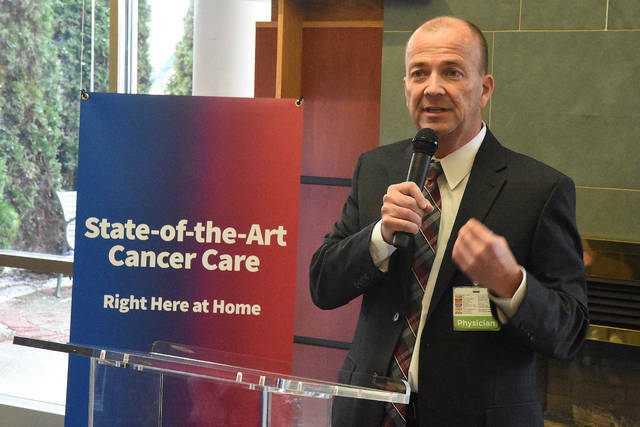 Excitement was very much in the air Wednesday morning at the Mercy Health-St. Rita’s Cancer Center in Lima as a partnership that has been in the making for nearly a year was made public. Mercy Health has teamed with The Ohio State University Comprehensive Cancer Center-Arthur G. James Cancer Hospital and Richard J. Solove Research to bring state-of-the art oncology treatment options and resources to Lima, allowing cancer patients and their families to stay closer to home while battling the disease. Dr. Chris Rhoades, director of the oncology department at St. Rita’s, made the importance of the event even more personal. 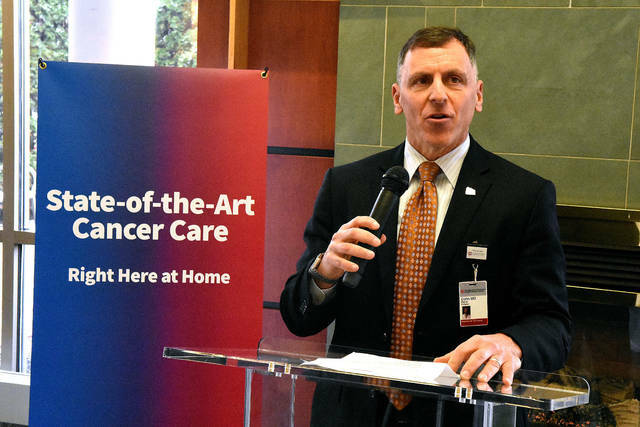 Dr. David Cohn, chief medical officer at the OSU Comprehensive Cancer Center, termed the new partnership between Mercy Health and “The James” a landmark event. “As health care professionals in Ohio State’s cancer program collaborate with professionals in the excellent cancer programs offered by our affiliates in The James Cancer Network, more and more people with cancer are experiencing better outcomes, fewer side effects and more hope — without venturing far from home,” said Cohn. According to information provided by Mercy Health, 582 new invasive cancer cases and 245 cancer-related deaths occurred annually on average in Allen County between 2010-2014. 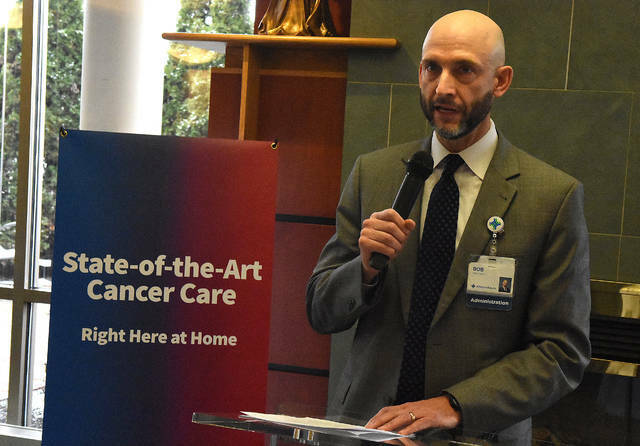 “This affiliation provides Mercy Health-St. Rita’s Cancer Center physicians and patients access to the expertise and sub-specialization at The James as network members, while allowing patients to stay close to home where they will be near their loved ones and support system,” Baxter said. He thanked all the partners for working so diligently to bring the partnership to Lima. “It really does take a village to pull something like this off,” said Baxter.